Les lipides membranaires des cellules activées peuvent être transformés en médiateurs lipidiques biologiquement actifs. 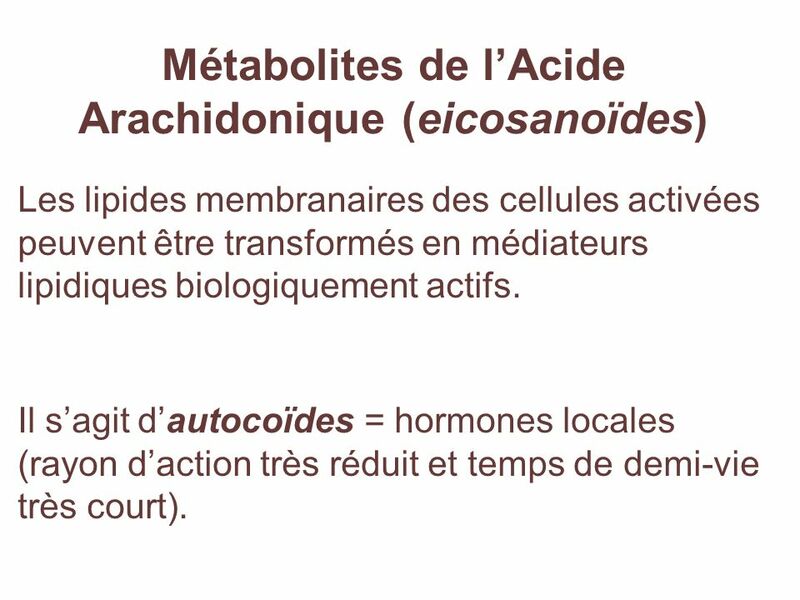 Il s’agit d’autocoïdes = hormones locales (rayon d’action très réduit et temps de demi-vie très court). 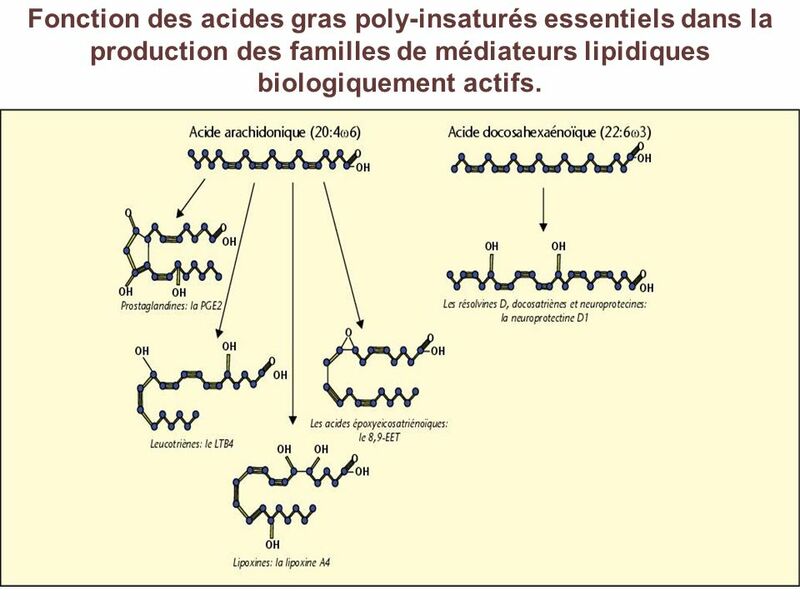 7 Fonction des acides gras poly-insaturés essentiels dans la production des familles de médiateurs lipidiques biologiquement actifs. 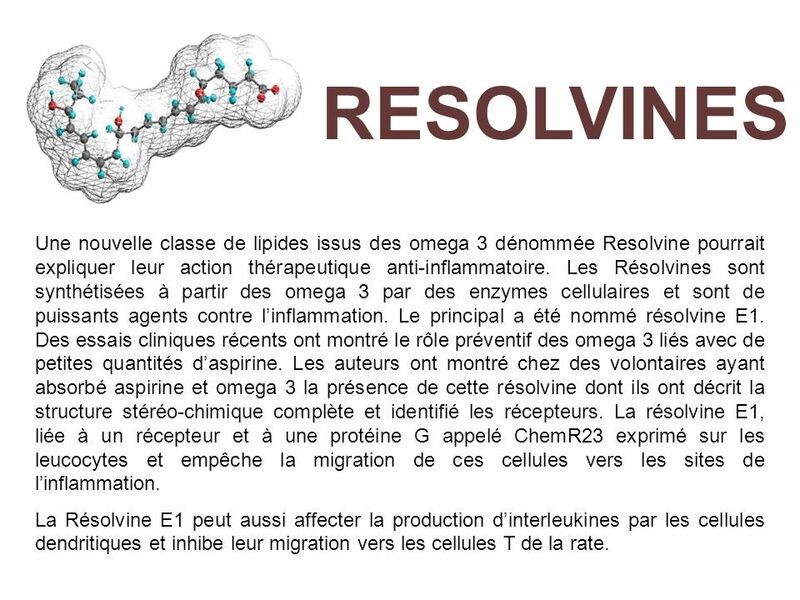 8 RESOLVINES Une nouvelle classe de lipides issus des omega 3 dénommée Resolvine pourrait expliquer leur action thérapeutique anti-inflammatoire. Les Résolvines sont synthétisées à partir des omega 3 par des enzymes cellulaires et sont de puissants agents contre l’inflammation. Le principal a été nommé résolvine E1. 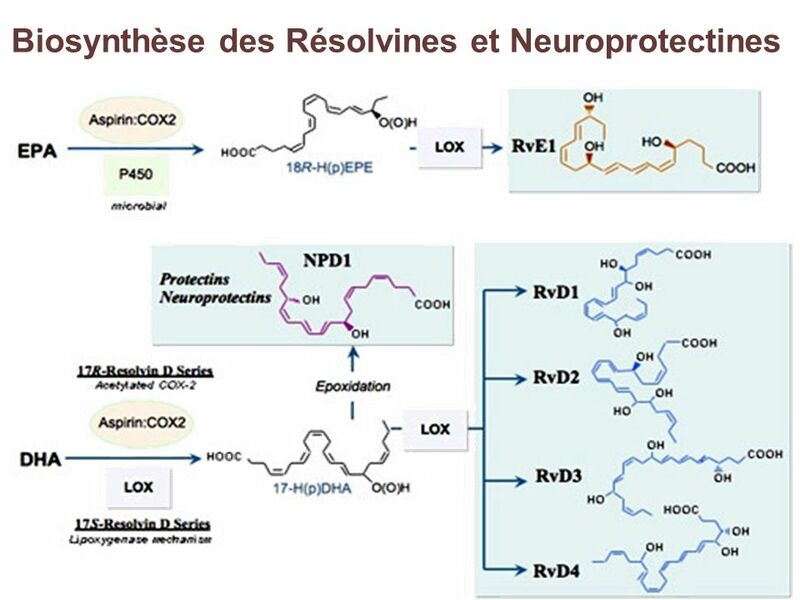 Des essais cliniques récents ont montré le rôle préventif des omega 3 liés avec de petites quantités d’aspirine. 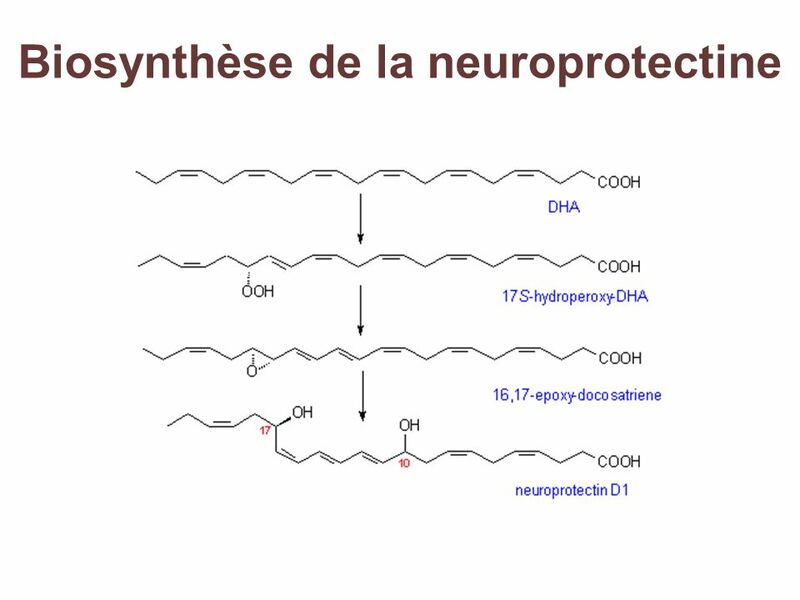 Les auteurs ont montré chez des volontaires ayant absorbé aspirine et omega 3 la présence de cette résolvine dont ils ont décrit la structure stéréo-chimique complète et identifié les récepteurs. 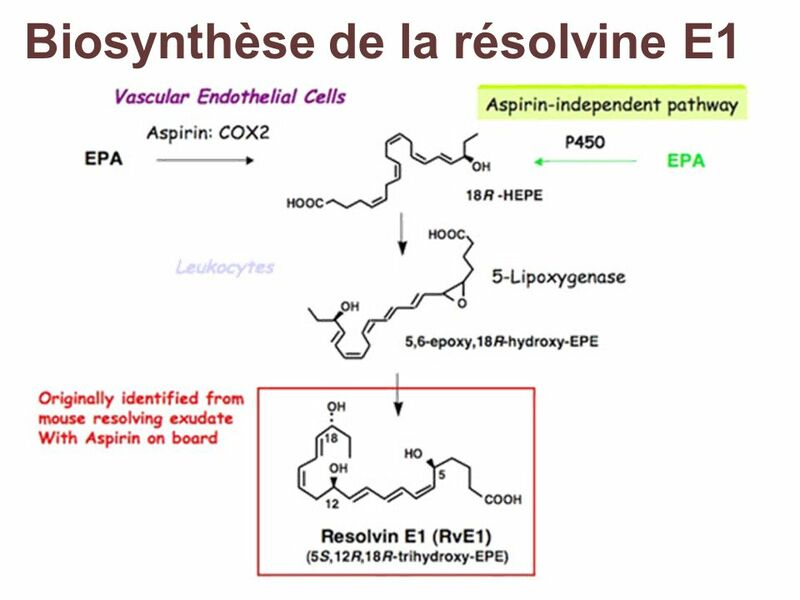 La résolvine E1, liée à un récepteur et à une protéine G appelé ChemR23 exprimé sur les leucocytes et empêche la migration de ces cellules vers les sites de l’inflammation. 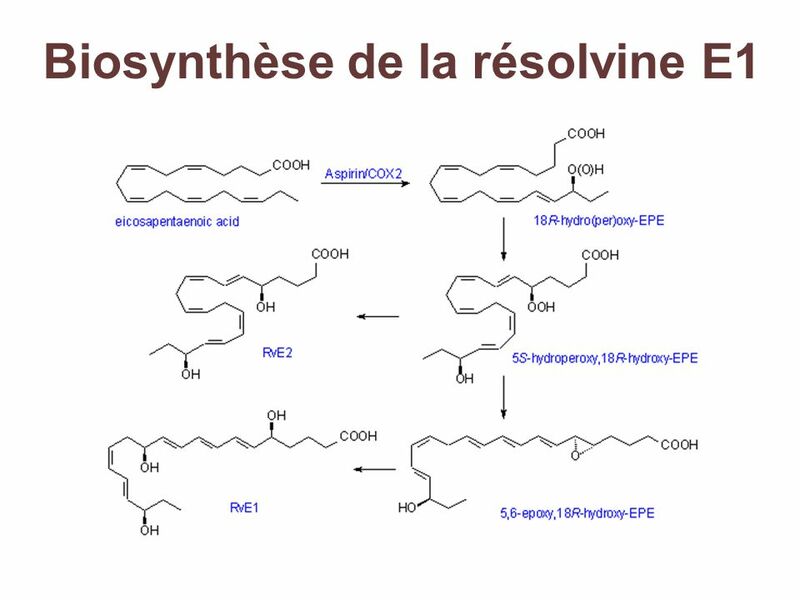 La Résolvine E1 peut aussi affecter la production d’interleukines par les cellules dendritiques et inhibe leur migration vers les cellules T de la rate. 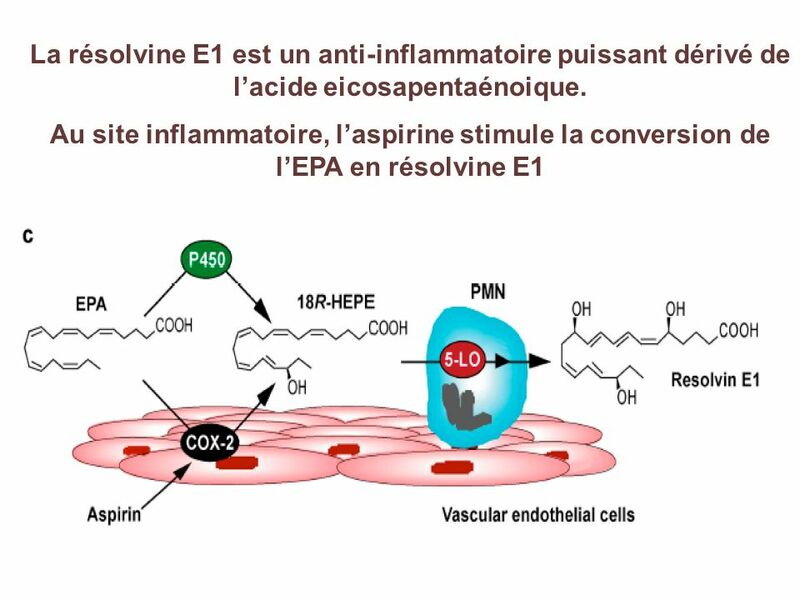 9 La résolvine E1 est un anti-inflammatoire puissant dérivé de l’acide eicosapentaénoique. 13 Resolvin E1 promotes mucosal surface clearance of neutrophils: a new paradigm for inflammatory resolution. Campbell EL, Louis NA, Tomassetti SE, Canny GO, Arita M, Serhan CN, Colgan SP. 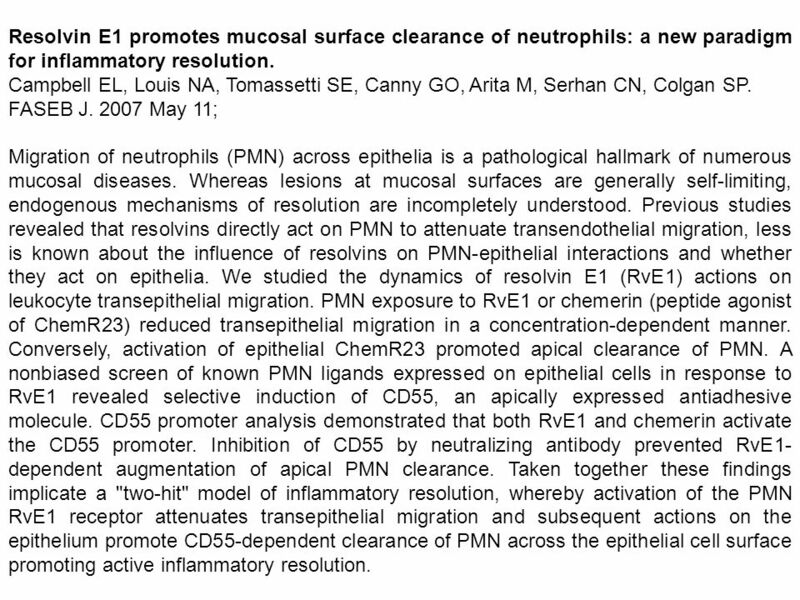 FASEB J May 11; Migration of neutrophils (PMN) across epithelia is a pathological hallmark of numerous mucosal diseases. Whereas lesions at mucosal surfaces are generally self-limiting, endogenous mechanisms of resolution are incompletely understood. Previous studies revealed that resolvins directly act on PMN to attenuate transendothelial migration, less is known about the influence of resolvins on PMN-epithelial interactions and whether they act on epithelia. We studied the dynamics of resolvin E1 (RvE1) actions on leukocyte transepithelial migration. PMN exposure to RvE1 or chemerin (peptide agonist of ChemR23) reduced transepithelial migration in a concentration-dependent manner. Conversely, activation of epithelial ChemR23 promoted apical clearance of PMN. A nonbiased screen of known PMN ligands expressed on epithelial cells in response to RvE1 revealed selective induction of CD55, an apically expressed antiadhesive molecule. CD55 promoter analysis demonstrated that both RvE1 and chemerin activate the CD55 promoter. Inhibition of CD55 by neutralizing antibody prevented RvE1-dependent augmentation of apical PMN clearance. Taken together these findings implicate a "two-hit" model of inflammatory resolution, whereby activation of the PMN RvE1 receptor attenuates transepithelial migration and subsequent actions on the epithelium promote CD55-dependent clearance of PMN across the epithelial cell surface promoting active inflammatory resolution. 14 Lipoxins and resolvins in inflammatory bowel disease. Weylandt KH, Kang JX, Wiedenmann B, Baumgart DC. 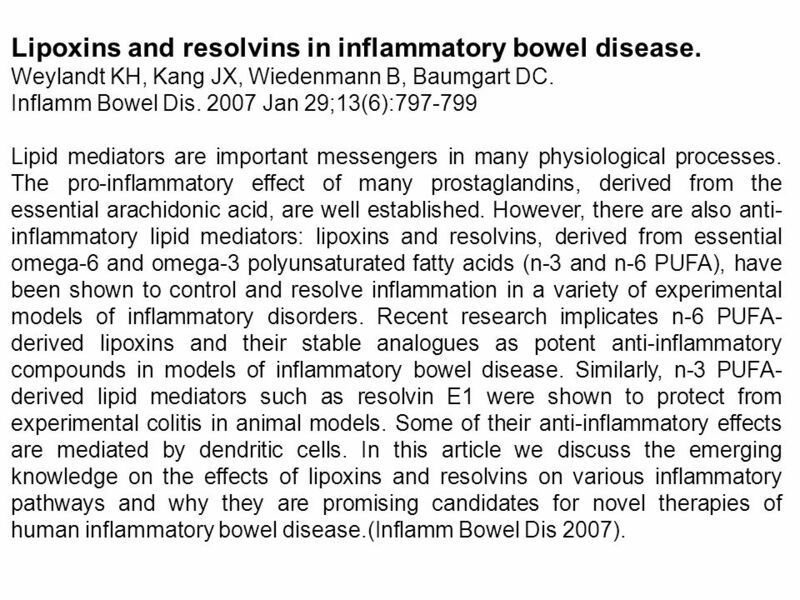 Inflamm Bowel Dis Jan 29;13(6): Lipid mediators are important messengers in many physiological processes. The pro-inflammatory effect of many prostaglandins, derived from the essential arachidonic acid, are well established. However, there are also anti-inflammatory lipid mediators: lipoxins and resolvins, derived from essential omega-6 and omega-3 polyunsaturated fatty acids (n-3 and n-6 PUFA), have been shown to control and resolve inflammation in a variety of experimental models of inflammatory disorders. 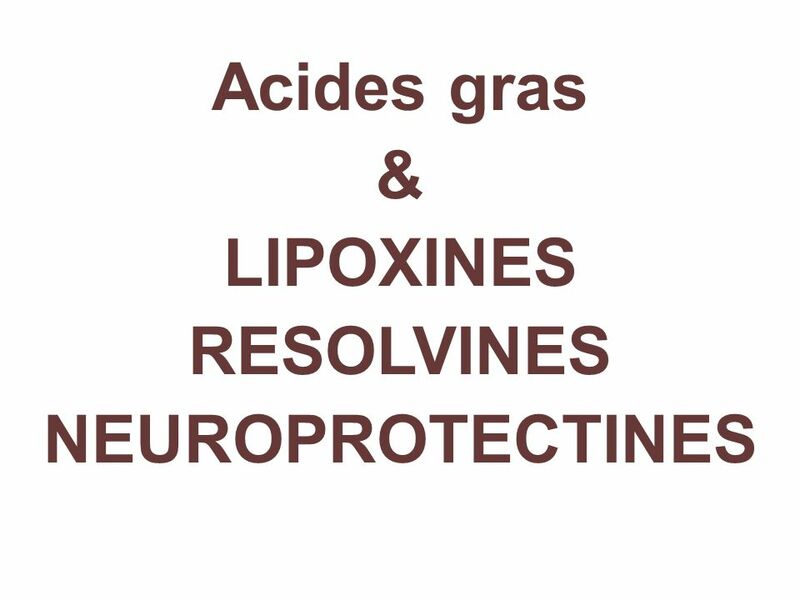 Recent research implicates n-6 PUFA-derived lipoxins and their stable analogues as potent anti-inflammatory compounds in models of inflammatory bowel disease. Similarly, n-3 PUFA-derived lipid mediators such as resolvin E1 were shown to protect from experimental colitis in animal models. Some of their anti-inflammatory effects are mediated by dendritic cells. In this article we discuss the emerging knowledge on the effects of lipoxins and resolvins on various inflammatory pathways and why they are promising candidates for novel therapies of human inflammatory bowel disease. (Inflamm Bowel Dis 2007). 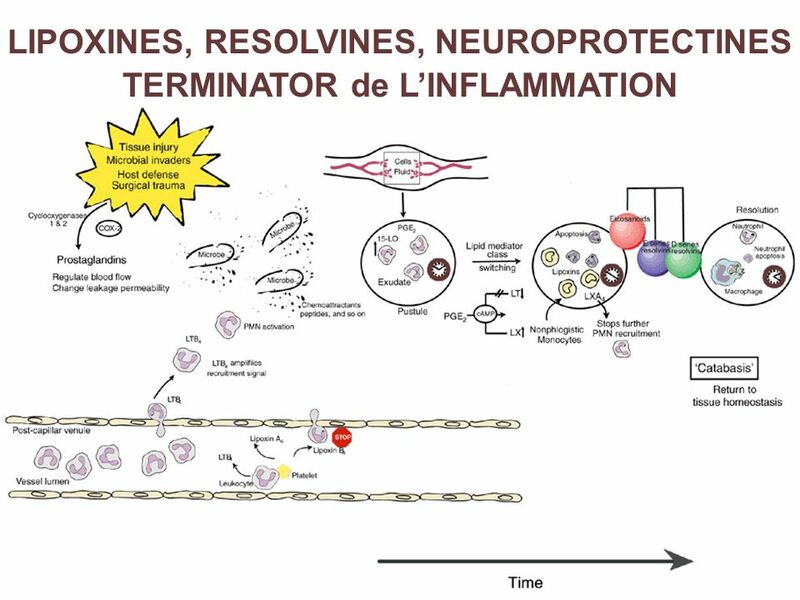 15 Resolvins and protectins in the termination program of acute inflammation. Ariel A, Serhan CN. Trends Immunol Apr;28(4): The physiological resolution of a well-orchestrated inflammatory response is essential to maintain homeostasis. Therefore, gaining a comprehensive understanding in molecular terms of the events that direct the termination of acute inflammation is imperative. 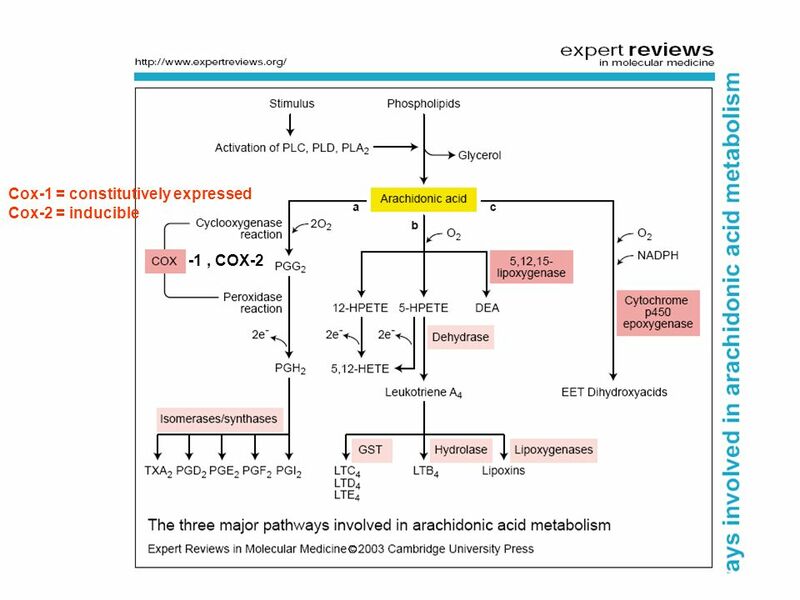 Recently, new families of local-acting mediators were discovered that are biosynthesized from the essential fatty acids eicosapentaenoic acid and docosahexaenoic acid. 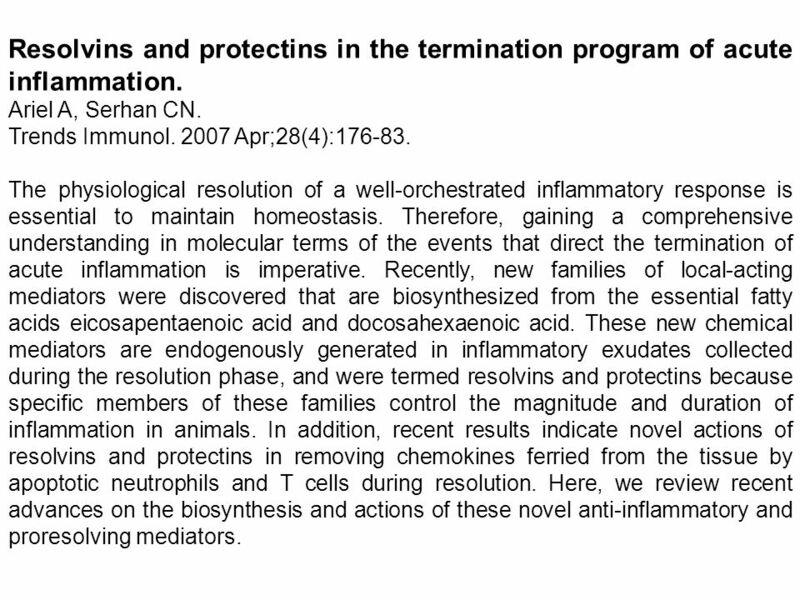 These new chemical mediators are endogenously generated in inflammatory exudates collected during the resolution phase, and were termed resolvins and protectins because specific members of these families control the magnitude and duration of inflammation in animals. 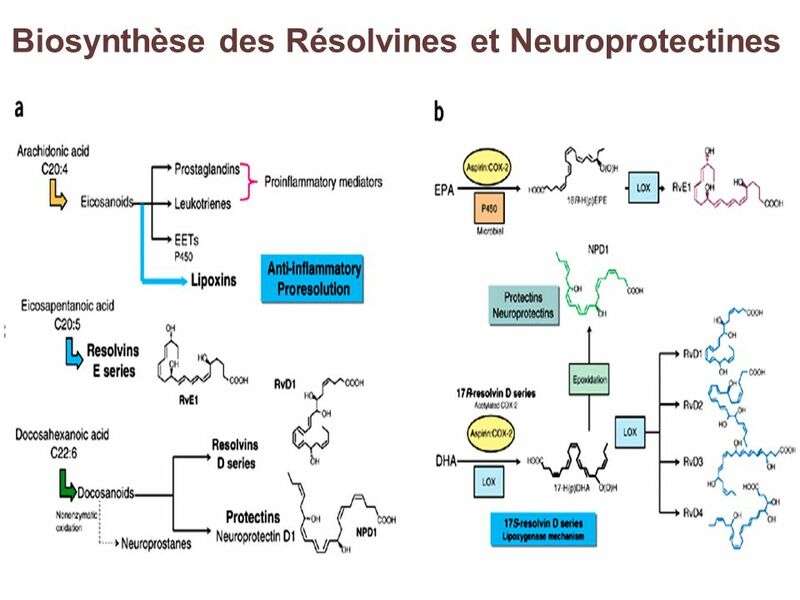 In addition, recent results indicate novel actions of resolvins and protectins in removing chemokines ferried from the tissue by apoptotic neutrophils and T cells during resolution. Here, we review recent advances on the biosynthesis and actions of these novel anti-inflammatory and proresolving mediators. Francais 1 Les pronoms démonstratifs. Les personnes et les objets!!! We use these demonstrative pronouns to point out people or things. In English, we. Le pronom EN Meanings: Some, any, of it, of them, from it, from them, or from there. CHALOUPE Global change, dynamics of exploited marine biodiversity and viability of fisheries Funded by the French national Agency of research – Call 2005. 5 Contractions Les normes: Communication 1.1 – Understanding the spoken and written language Comparisons 4.1 – Understanding the nature of language through.